Steve Bak (author of the Cuthbert games as well as Hercules and C64 Ghostbusters 2) was one of the first Atari ST programmers, owning the UK’s first development kit and working on games before its official UK release. His 16-bit games included a vertically-scrolling shoot ’em up called Goldrunner, not released for 8-bits. Issue 2 of Soft magazine reported that he was working on a horizontally-scrolling follow-up (direct or indirect, we are not sure) called Genesis, but this time a C64 version was mooted. 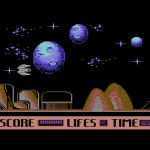 The game (now called Return to Genesis) surfaced in 1988, but not for the C64. A 16-bit game called Goldrunner II was released for 16-bits in 1988, but this was vertically-scrolling and not directly coded by Bak. Was a C64 version really planned, who was behind it, how far did it get, and why was it not released?